Even those who have never kept an aquarium will have heard of the guppy! Discovered in the middle of the 19th century, it is one of the most popular species owing to its uncomplicated breeding habits and the large number of available varieties, which are classified according to overall coloration and the shape of the caudal fin. The guppy prefers hard, alkaline conditions, but it is extremely tolerant. A female can produce up to 100 fry every 4 weeks if the temperature is raised to 27-28°C. 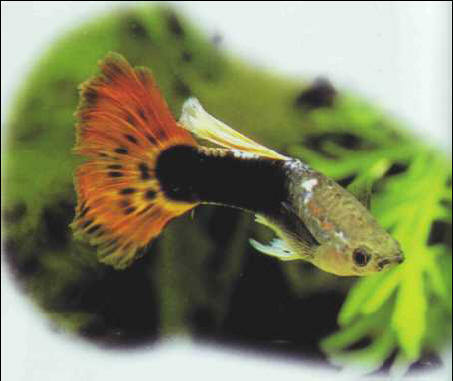 Feral guppies are unspectacular in color, with sometimes one or two black patches, and the fins are of normal size. Size: 5 cm.